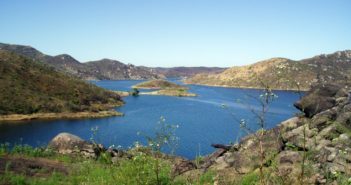 The city of San Diego has announced a tentative date to reopen what is arguably San Diego’s premier freshwater fishery, San Vicente Reservoir. 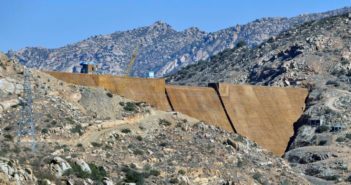 Construction on San Vicente’s dam raise project began with the lake’s closure to fishing in September of 2008, with work on the dam beginning in June of 2009. 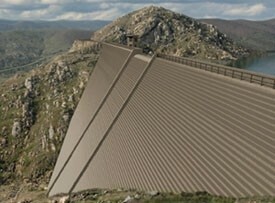 Largest water storage increase in county history adds 152,000 acre-feet of capacity. 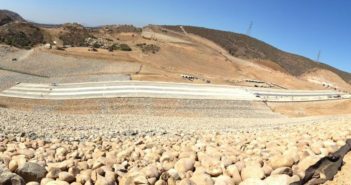 A time-lapse video showing the construction of the San Vicente Dam Raise Project. A flowing creek dumping water into San Vicente ReservoirMany of you have probably noticed that the reservoirs haven’t all benefited from the recent rains equally. There are dozens of factors in play to account for how many vertical feet a lake will rise, which is generally how we gauge the water and health of the lake. Obvious factors like the current size of the lake, and the steepness of the exposed shoreline account for how quickly the water level can rise vertically. But another factor, which isn’t obvious to the naked eye is the watershed, or the area of land where water drains off of it into a given area. 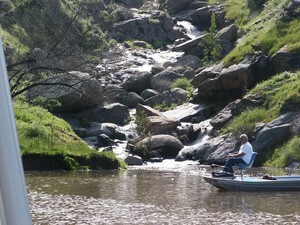 Think of watersheds as a funnel pointing into a given lake. The bigger and wider the funnel mouth, the more water it collects and pours into the lake.